Drywall is both a wall covering with ceilings, and a box with slopes, and all sorts of figured designs created by the imagination of designers. And if at first this material had opponents who did not trust the new technology, now there are practically no more. After all, years have passed, and the products assembled from GCR have been successfully tested for strength and durability. An important parameter is the size of the drywall sheet and its appearance. 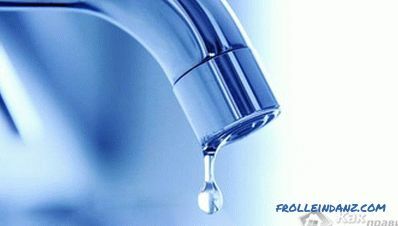 Having picked it up correctly, you can minimize the amount of waste and save well. Next, read about how not to be mistaken with the size, choose the desired type of gypsum board and distinguish quality material from a fake. With the help of GKL, construction is carried out using dry technology, and it is these sheets that serve as the basis of the structures. 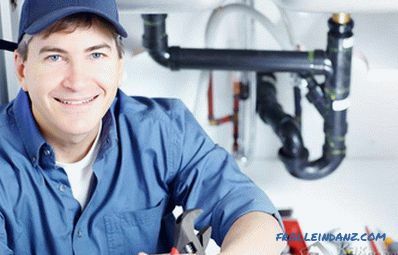 And all other elements are used for their installation, connection and finishing. Each gypsum plasterboard consists of a gypsum flat core framed by cardboard on both sides of it and along the long edges. Used cardboard, despite its small thickness, has increased strength. It makes the sheets sufficiently rigid, and the core, made of plaster with special additives, may vary in composition to achieve certain goals. For example, it can make GCR moisture-resistant, not afraid of fire, intensively absorbing noise. Studying the nomenclature of drywall of different brands, you can see that manufacturers are guided by general principles. They proceed from the requirements for structures and mounted structures that exist at the moment. Most manufacturers produce several main types of gypsum boards used in various fields. The most popular of them - GKLV and GKLV. Read more - next. It is also called building (or basic). These plates can revet the walls, sheathe ceiling and wall frames made of wood or metal. Basic drywall plates are also suitable for intricate design designs. Restrictions on the use: use only indoors (provided that the humidity is normal). For finishing work in the apartment most often use this type of gypsum plasterboard. It is easy to distinguish by the light gray color of the cardboard. This material, which is labeled with GKLV, is used in rooms where the humidity is medium or high. Special modifiers have been added to the gypsum core, due to which moisture absorption decreases dramatically. In addition, in such a drywall does not settle the fungus. Therefore, it is used for work in bathrooms and kitchens, in the attic living rooms, on loggias and balconies, where there is heating. Still from moisture resistant plates make slopes. And if you apply waterproofing obmazochnogo type, then you can veneer the walls in the shower or pool. It is worth noting that it is not at all necessary to apply the GKVL only where it is damp. The standard size of moisture-resistant drywall and its increased strength allow it to be used for covering any structures in an apartment or house. The color of the facing paperboard is green. This material (marked with GKLO) is similar in functionality to the two previously described - it is processed and bent in the same way. Thanks to special additives, the gypsum core of such drywall can withstand high temperatures twice as long. Thanks to this feature, smoke and fire cannot quickly spread. For wet rooms, there are special brands of fire-resistant drywall. GKLOs are used for the construction of fireproof partition walls, and they sheathe cable ducts, ventilation, mines, and steel structures. You can use fire-resistant sheets and when you need to fence off a separate room. 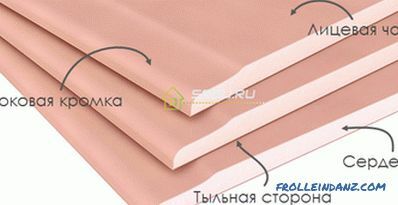 As a rule, this material is used in offices, enterprises, in public buildings. Cardboard lining has a light shade. Some manufacturers make it red - for example, the company Rigips (brand of drywall RIGIMETR FIRE-Line PLUS). This material has other names: arched, flexible. It was invented for the construction of complex structures in which it is necessary to bend parts with a small radius. For example, it can help with the installation of arched elements or complex suspended ceiling. 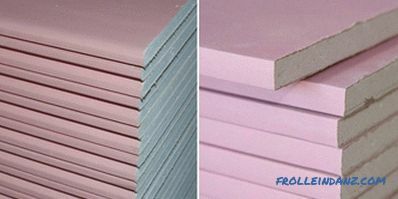 Plates of flexible gypsum board differ in their small thickness - from different manufacturers it varies from 6 to 6.5 mm. In addition, the core is reinforced with fiberglass mesh, which can go in several layers. Designs are sheathed with two layers of such sheets. When installing you do not need to prick or wet the drywall - everything is done in a "dry" way.If there are special requirements for fire safety, you can use flexible sheets GFL produced by Giprok. They have high fire resistance. This material (reinforced) is designed to withstand heavy loads. 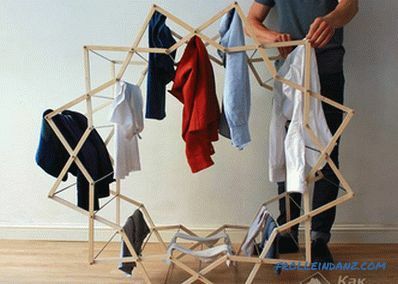 For example, you need to hang something heavy on the wall - fasteners will not fall out of the reinforced sheet. Apply a drywall in any room. A number of manufacturers produce reinforced slabs with additional properties. For example, they may be flame retardant or waterproof. As an example we can take the GKLVU from the company Giprok and Diamant from the company Knauf. The last manufacturer has more products called "massive." They are 25, 20 and 18 mm thick. In our country, they are also commonly referred to as high-strength slabs. able to absorb electromagnetic waves. There are other types of drywall - for example, Akvapaneli, which Knauf produces. Their core is made not on gypsum, but on cement base, on both sides it has a frame of fiberglass. This building material is even suitable for exterior facades, as it is well protected from most of the negative factors. And another example worth citing is gypsum fiber (abbreviated GVL). Such a plate consists of a gypsum base with the addition of cellulose fibers. It is very tough and durable, not exposed to fire and has a flat surface. Due to this primer is not required before finishing. 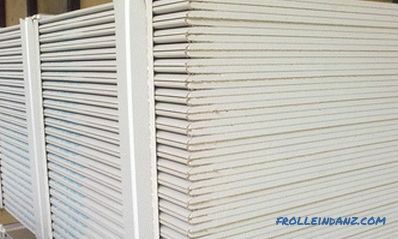 Gypsum fiber sheets are used in many cases - for example, when installing a dry floor, during outdoor work (including for assembling structures of frame houses). You can use them in areas where it is damp. 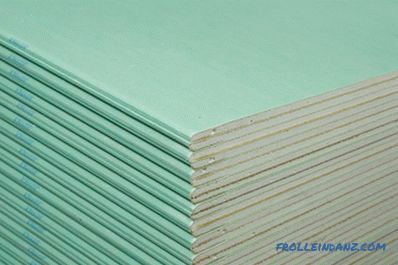 Almost all brands of gypsum cardboard are distinguished by a cardboard edge along the length of the side of the sheet. It usually has a smaller thickness towards the edge, which makes it possible to put up these places with putty when joining sheets, and also to use paper, cloth or fiberglass for reinforcement. It turns out a smooth and durable surface. On the seamy side of drywall sheets there are symbols that make it clear which type of edge is used in this sheet. PC - the edge of the straight configuration. CC - an edge that is thinner on the outside than on the inside. PLC is an edge that is semicircular on the outside. PLUK - hem, semicircular and thinned from the outside. LC - edge rounded on both sides. When cladding in several layers (as well as for technical areas), this chamfer is overkill - it is better to choose sheets with a straight edge. The refined edge should be chosen only for finishing with the subsequent putty. The standard length of a drywall sheet is 2, 2.5, and 3 m in length. However, there are manufacturers who produce sheets 1.5 in length , 2,7, 3,3 and 3,6 m. In addition, if necessary, you can cut the drywall directly at the factory, ordering your own sizes. If you need to veneer the entire wall to the ceiling, then it makes sense to buy long sheets. This will result in fewer seams (horizontally, they will not be at all). And jumpers do not have to put. But if you have ceilings 2.7 m, and the length of the sheets - 3 m, then it does not make sense to acquire them. After all, the waste will be quite a lot, and the fuss with the long heavy plates is a lot. Without assistants do not succeed. Before buying three-meter sheets, be sure to check whether they will enter the door of the entrance and the apartment, as well as the elevator. 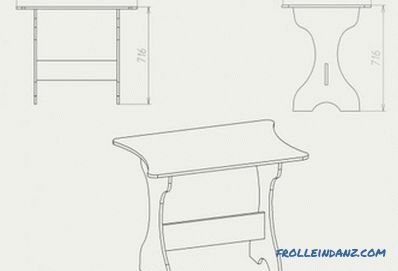 Sometimes it will be preferable to place an order for several sheets of different lengths - everything is decided individually. Standard drywall length: 2; 2.5; 3 m.
This parameter is usually standard - 1.2 m, which is why the racks for the frame have a pitch of 0.4 or 0.6 m. and light sheets of small format, which are half the width (0.6 m), and the length is 1.5 or 2 m. They fit well in a passenger car, you can mount them alone, but you can use them better on small planes. Otherwise, too many seams work. Flexible plasterboard can also be narrow (GKLD brand from Giprok company has a width of 0.9 m). In thickness, the dimensions of a drywall sheet are 6, 9, 12.5 mm. Options are 6.5 and 9.5 mm. Reinforced and fire resistant plates can be produced with a thickness of 15, 18, 25 mm. Thin (6 mm) sheets are used for the manufacture of arches and other similar structures. If the bending radius is large, it is unprofitable to take them - after all, flexible drywall is expensive. It takes twice as much, because the products made from it are double-layered. Lightweight sheets with a thickness of 9 mm are intended for ceilings, since they are not deformed in the space between the profiles. For walls, they are not suitable - not so durable. However, for ceilings, experienced craftsmen prefer to take thicker sheets - 12.5 mm (wall). They are quite flexible and durable, have shown themselves well when mounted on a profile with a pitch of not more than 0.6 m. This thickness of gypsum cardboard is the most demanded, and it is better suited for the ceiling, as experience has shown. In such sheets and screws are screwed better, and fixtures on them hold tight. 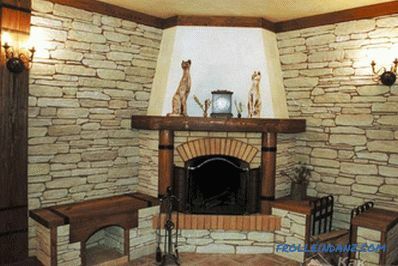 For walls, they can be mounted in several layers - this is more reliable and durable. 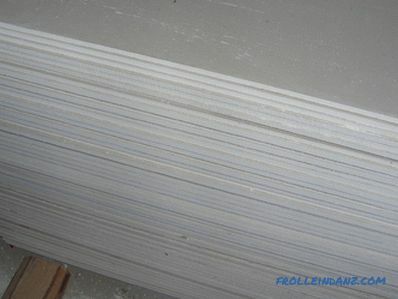 The most demanded thickness of a sheet of plasterboard: 6; 9; 12.5 mm. Now we will tell you how to choose drywall. Having come to the store or to the market, you should carefully examine the FCL for quality. However, well-known reliable brands usually do not let buyers down, but sometimes they also release defective lots. But after all, gypsum plasterboard is to be ridden after transport and in a warehouse to lie down, and in different conditions. Sometimes sellers simply dump sheets on the street under a canopy or store them in a damp warehouse. If pallets with GCRs are put on each other, then the core can be crushed, sheets are deformed, scratches and dents are formed. And sloppy movers, carelessly draining long sheets, damage the cardboard lining. As a result, there is a lot of marriage, which the inattentive buyer may not see. Tip 1. Acquire drywall at a large retail outlet. There he will not lie exactly for a long time. Tip 2. Look at the warehouse, look at the storage conditions. If it is wet, do not take the material. Tip 3. When loading and unloading slabs, make sure that this is done carefully. Tip4. Check each plate for dents, scratches and other defects. The plate is not cut off right angle (factory marriage). If you need a lot of material, you can make a trial purchase - one sheet. Cut it with a knife into strips and see if the core is uniform, if the cut is even, or if there are no foreign inclusions. And in order not to be mistaken, take the products of reliable brands: Giprok, Knauf, Lafarge, Rigips.